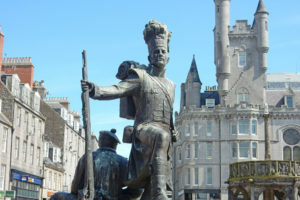 Aberdeen is Scotland’s third most populous city, one of Scotland’s 32 local government council areas and the United Kingdom’s 37th most populous built-up area, with an official population estimate of 196,670 for the city of Aberdeen and 229,800 for the local authority area. Nicknames include the Granite City, the Grey City and the Silver City with the Golden Sands. During the mid-18th to mid-20th centuries, Aberdeen’s buildings incorporated locally quarried grey granite, which can sparkle like silver because of its high mica content. Braemar Gathering attracts competitors and spectators from all over the World. The annual attendance is around 16,000 and normally members of the Royal Family attend during some of the events. The massed pipe bands provide an excellent spectacle. The event is fairly unique taking place in the Village of Braemar, Population about 400, amidst the heather clad Cairngorm Mountains. Go wild through the night on Scotland’s toughest night trail race. Now with two brand-new routes: 8km, 15km or the classic 15 miler! Run or walk over rugged hill trails with just the glow of your head torch to lead the way and raise funds for our charity partner Braemar Mountain Rescue. Experience the natural beauty of Glen Tanar in a spectacular new light! Scottish weather – All participants must be self-sufficient – be prepared! Eco medals – Turn your memento coaster into a jute ribbon eco-medal…if you want! The Illuminator’s shortest route – family friendly but not a walk in the park! Open to young people from 14 years old. Easy to run or walk on solid trails sheltered amongst the trees. Still with a significant challenge: all routes share the mighty climb of Craigendinnie after you’ve visited the light zone. And yes, even though this is the short route we are sending you up the steep way! Our new middle distance route traverses the open ridge above Glen Tanar – more accessible than the classic 15 mile route but more exposed than our 8km route. The 15km route rewards you with a spectacular view of up to 4km of light trails from your fellow participants head torches. Our reflectives and lightzone will cheer you on, as will the snacks and hot juice before the final tough climb. Now available to young people from 16 years upwards looking for an epic challenge. This route is open to walkers and runners. The original Illuminator route and longest distance – a serious physical and mental challenge. Runners only please! Come back to measure yourself against previous years’ efforts or jump in at the deep end if you want to test yourself with a hilly route that passes through the heart of Glen Tanar’s ancient forest and follows the beautiful Water of Allachy and Water of Tanar.